San Diego was soaked by a powerful storm Thursday that may produce thunderstorms before moving east. A powerful storm produced dangerous driving conditions and led to several highway collisions including one fatal crash in Lakeside, California Highway Patrol Officers said Thursday. 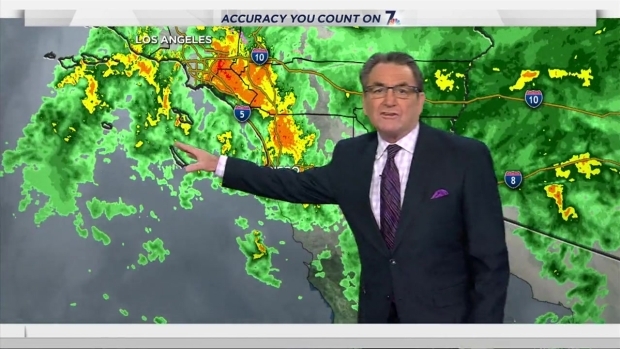 A tropical storm moving north into San Diego from Mexico brought a lot of moisture in a short amount of time beginning late Wednesday. More than an inch in many communities and more than two inches in some of our mountains. Excess water on the roads has led to multiple crashes on our local highways. In Lakeside, a driver died when she lost control on rain-slicked roads and crashed along eastbound Interstate 8 just before midnight Wednesday, California Highway Patrol officers said. The driver, described as a 23-year-old woman from San Diego, crashed into the guard rail and overturned just east of Los Coches Road. CHP officials say the woman was traveling at approximately 65 mph and was attempting to change lanes before the crash. Video of the crash along Interstate 805 in Chula Vista where a man was struck by an oncoming big rig in Thursday's storm. 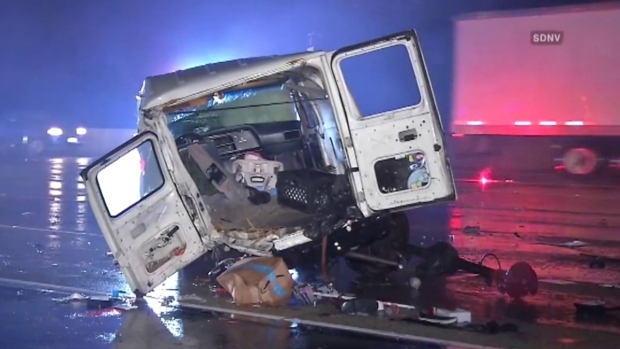 In Chula Vista, a van driver changing a flat tire in the rain was struck by an out-of-control big rig on the shoulder of Interstate 805 at 2:23 a.m., CHP officers said. The semi made an unsafe turn to the right, CHP officers said, and collided with the van. The van struck a man who had been standing outside the van while changing one of the tires. He suffered major injuries, officers said. A woman sitting in the passenger seat of the van was also injured. The truck kept moving and struck a traffic sign before running off the road. The truck driver and the two people from the van were rushed to UCSD Medical Center. 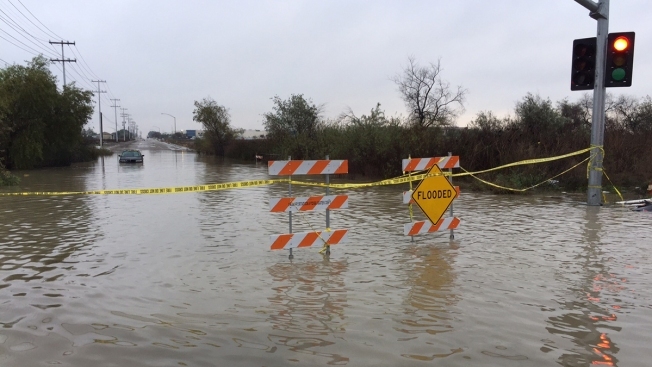 In Otay Mesa, one person had to be rescued just before 7 a.m. after a vehicle became stuck in approximately 2 feet of water near Airway and La Media Road. Boulders were reported in the road in Del Cerro just after 4:30 a.m. Five large rocks fell from a hill onto Bernadette Lane. No one was injured. “It’s just a ball of energy and it’s moving very slowly,” said Whitney Southwick from the NBC 7 Weather Center. Rain, heavy at times, will move on shore throughout the day with showers tapering off by late afternoon. The heavy rain Wednesday night caused flooding in some parts of the county, including a neighborhood in Lakeside. There, resident Norma Lozano told NBC 7 she had mixed feelings on the storm: she was happy to see the rain but also worried about flooding near her property. “We want the rain, but we don’t want it in excess. We want it a little bit at a time,” Lozano said. Last time a storm hit, Lozano said she had to dig a trench around her home and lay out sand bags. Wednesday night, she had shovels on hand in case she had to dig once again. Homeowners Ken and Darolyn Hughes were also concerned about flooding around their property on Lemoncrest Drive – a home purchased just 12 days ago. City crews waded through knee-high water, putting up flood warning signs. Meanwhile, the Hughes’ laid out sand bags and tried to protect their property as much as possible, fearing the heavy rain would lead to erosion. It took a lot of work and led to a sleepless night for them. Residents in the South Bay may experience thunderstorms, Southwick said. The rain didn’t stop some locals from running their last-minute holiday errands, including some Christmas shopping. Jadyn Study and her friend were out shopping and both said it was nice to have some rain, adding that it put them into the spirit of the season. “It makes it [feel] more Christmasty. It feels great,” Study told NBC 7. This has been a fairly warm storm because it's coming out of Mexico. The next storm will be just the opposite, according to Southwick. It’s out of the north and will be much colder, much more “winter-like,” he said. The National Weather Service has issued a winter storm watch for Julian, Pine Valley and other mountain communities from Friday afternoon through late Saturday night. Snow levels will be near the 7,000-foot level Friday evening and will drop to the 4,000-foot level or 5,000 level Saturday morning and even lower reaching possibly the 3,000-foot level by Saturday evening, according to NWS.